Silverthorn and these other Tampa area communities allow active adults to live a low-maintenance lifestyle near children and grandchildren. Some of the best Tampa homes for sale are found in active lifestyle communities without age restrictions. Buyers looking for a multi-generational experience or an opportunity to live with children or grandchildren have some great options in the Tampa Bay area. Tampa covers a large metropolitan region and offers residents of all ages an opportunity for arts and culture, education, nature and parks, beaches, entertainment, and professional sports. And, it’s home to a growing and diverse population. According to 2018 statistics, more than 335,000 people live in Tampa, and 40 percent of the area’s households have at least one person over 60 years of age living there. New and resale homes are available for buyers of all ages at Esplanade of Tampa. 300 single-family homes in the Novelli Collection and the La Palma Collection offer two or three bedrooms and between 1,856 and 3,006 square feet of space. At the 5,000 square-foot clubhouse, residents can enjoy the fitness center and the multi-purpose room or swim in the outdoor pool. There’s also a dog park, a fire pit, and pickleball courts. Ideally located in Tampa where Interstate 275 intersects with Interstate 75, Esplanade of Tampa puts residents in proximity of Downtown Tampa and outstanding shopping opportunities in Wesley Chapel and Lutz. The community is close to The Shopped at Wiregrass, a large outdoor shopping center, and Tampa Premium Outlets. Active adults looking for Tampa Bay real estate that’s right on the water and on the perimeter of a nature preserve will be dazzled by the views and the lifestyle at MiraBay in Apollo Beach. This community is just 30 minutes south of Downtown Tampa and has boat slips and a boat launch with access to the Gulf of Mexico. MIraBay was built around Wolf Branch Creek Nature Preserve, so the hiking, fishing, and birdwatching are pretty unbeatable. Amenities include a fitness center, where personal trainers are available and exercise classes are frequently held, a zero-entry pool, a spa, a playground, and basketball and tennis courts. Dozens of floor plans in diverse sizes and layouts that range between 1,586 and 3,514 square feet are available. Several different builders have brought their own unique design elements to these properties, and buyers can select a home with a view of the water or additions like game rooms, kitchen nooks, and loft spaces. Apollo Beach has all of the grocery stores, retail establishments, and restaurants that people need, and it’s also home to the Manatee Viewing Center where Florida’s famous sea cows spend their winters. Tampa homes for sale on a 36-hole golf course can be found at Lake Jovita Golf and Country Club in historic Dade City. There are no age restrictions in this community, and country club memberships are available at different levels. In addition to the golf course, there’s a 15-acre practice facility, a pro shop, Olympic-sized swimming pool, and restaurants. Playgrounds, parks, and picnic areas invite residents to congregate outside, and there’s also pickleball and tennis courts. Workouts at the fitness center might include a cycling class. A total of 875 new and resale homes are available, most of them with three or four bedrooms and between two and four bathrooms. Sizes start at 1,641 square feet and go as high as 3,707 square feet. In the area, it’s easy to explore sites of interest such as Dade Battlefield where the U.S. fought its longest and costliest war against Native Americans. There's also Florida National Cemetery, a military cemetery still providing active burials to members of the armed forces and their eligible family members. 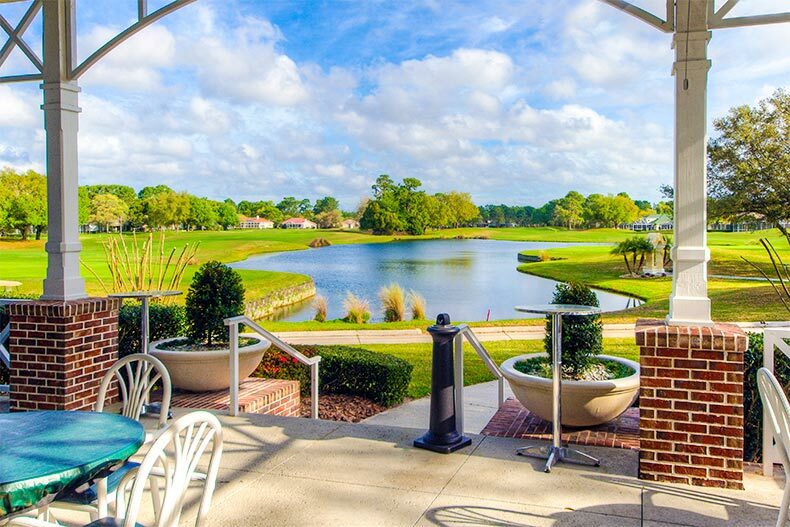 Buyers looking for an intimate community without age restrictions might consider Cambridge at Villages of Avalon north of Tampa, in Spring Hill. With only 78 new, single-family homes available, there’s a good chance you’ll get to know your neighbors and their families. Located within the larger master-planned Villages of Avalon community, residents of Cambridge have access to many private and communal amenities, including the clubhouse, pool, and fitness center. Homes are affordable and comfortable, offering between 1,641 and 2,034 square feet of space in two-bedroom, two-bathroom models. The Delray model includes a den, and all homes have two-car garages. Spring Hill is a growing region with a lot of natural beauty and easy proximity to the beach and Downtown Tampa. Locals love watching the mermaid show at Weeki Wachee Springs. Silverthorn is a gated community north of Tampa in Brooksville. There are no age restrictions, and memberships are available at the semi-private Silverthorn Country Club, where there are 18 holes of golf, a pro shop, a putting green, a banquet room, and Traditions Bar & Grille. Other amenities in this community include a community center, fitness center, library, pool, playground, tennis courts, and storage space for boats and R.Vs. Active adults can join the book club, take an aerobics class, or play poker. Tennis lessons and teams are available for children and teenagers for residents living with extended family. Silverthorn is surrounded by nature and parks. It’s also close to grocery stores like Winn Dixie and local restaurants such as The Florida Cracker Kitchen and Main Street Eatery. Hiking, mountain biking, and horseback riding are popular at the Withlacoochie State Forest. Tampa has plenty of 55+ communities in the area, but individuals and families looking for a different experience before or during retirement can choose one of the attractive housing developments from reputable builders that are without age restrictions.